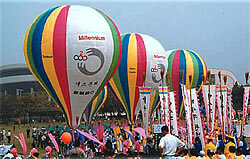 Ecolovy balloons are great for using at ceremonies as well as for giving away at promotional and other types of events. 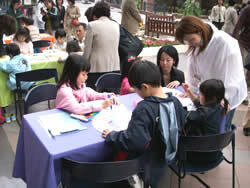 On October 21, 2007, Tokyo’s Waseda University celebrated its 125 anniversary. 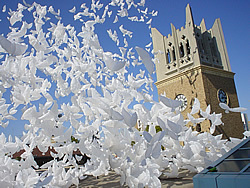 To commemorate this event, 2007 dove-shaped balloons were released into the blue sky from atop the Ohkuma Auditorium. 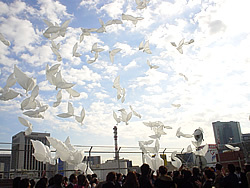 Because it was the very first time such a large number of dove-balloons had sent into the sky all at once, especially in such a busy metropolitan area in Tokyo, it became a very moving and impressive scene. 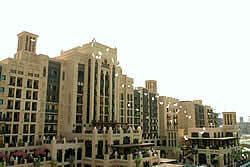 *Click to view all *Data may take some time to load. Please be patient. 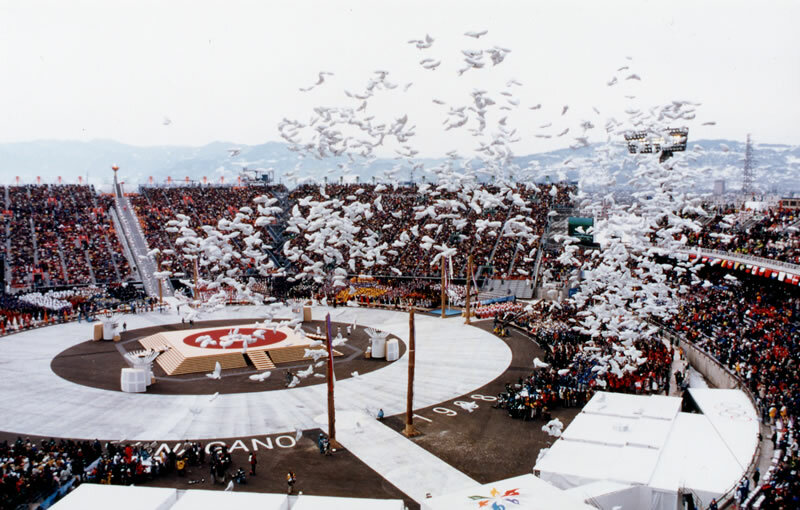 In February 1998, at the opening ceremony of the Olympic Games at Nagano, 1998 dove-shaped balloons made from paper were released. 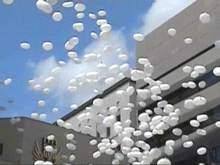 A flood of emotion swept the world as the balloons sailed into the sky. 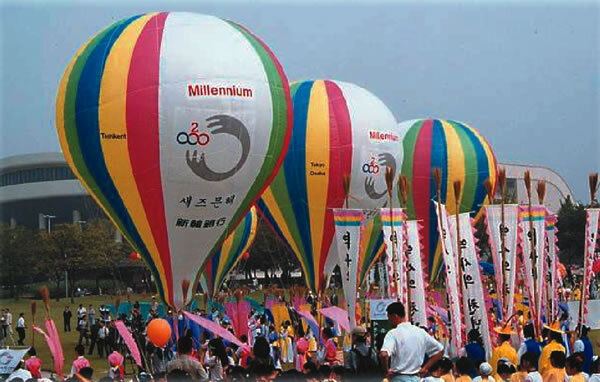 One of those 1998 balloons found its way across the Pacific Ocean and reached the Americas where it was found by a child. The story made local headlines. *Data may take some time to load. Please be patient. Ecolovy balloons were present at the grand opening ceremony of one of the world’s largest shopping centers in the United Arab Emirates city of Dubai. 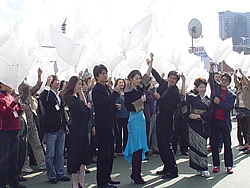 On November 13, 2004 the production staff of the Japanese film “Umineko” released dove-shaped balloons from the top of the Marunouchi TOEI Theater in Tokyo wishing for success for their film. 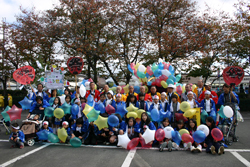 We recommend holding balloon drawing events at places like shopping malls, carnivals, fairs, and other places where families with small children gather. 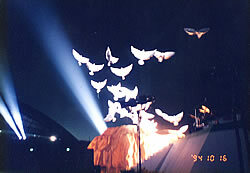 Educational locales such as aquariums, museums, and zoos can also host this fun event. Draw whatever you want on your balloon. Anyone can draw as long as there are markers or crayons. 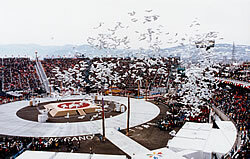 Once you’ve inflated your balloon with helium, you can release it at any time! 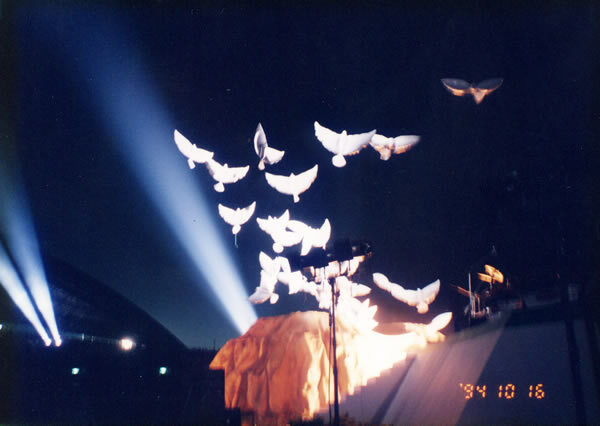 Or you can all release your balloons at the same time for a more dramatic effect! 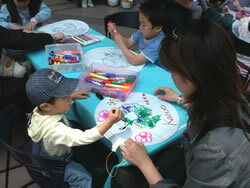 During the 2007 Golden Week period in Japan, a balloon drawing event was held at Tokyo’s Ebisu Garden Place. 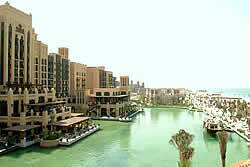 There was a large amount of families with young children there and because of that the event was a huge success.